Earn more money and set your company apart from the competition! Increase exposure to homeowners through NARI’s advertising and communications program with Better Home & Gardens’ Remodelmagazine, the official consumer magazine of NARI. Increase exposure to homeowners through NARI’s advertising and communications program with Home Improvement Magazine. Improve your knowledge of national consumer trends with a complimentary digital subscription to Better Home & Gardens’ Remodelmagazine, the official consumer publication of NARI. Earn more money learning better business practices through NARI’s alliance with E-Myth Contractor. Increase your company’s efficiency with business tips via NARI’s bi-monthly magazine and e-newsletter. 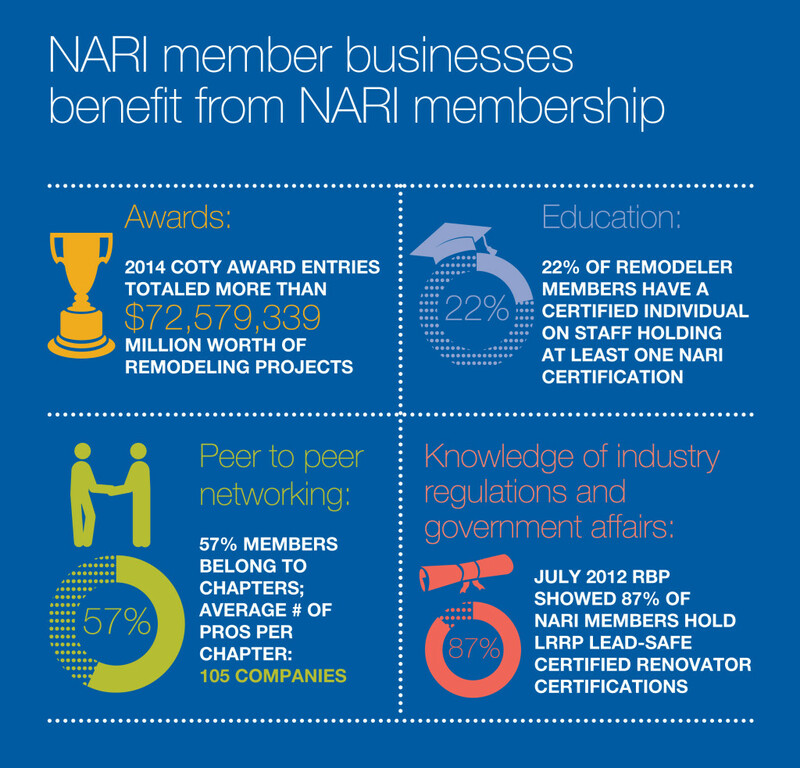 Save money with NARI’s discounted consumer marketing tools, including “How to Select a Remodeling Professional” and “Protect Your Family From Lead” guides. Save on health insurance and prescription drugs with NARI’s Health Benefits Program. NARI’s Marketing Committee chose Bolin Marketing to be its partner for a nationwide outreach to educate consumers on the importance of choosing a NARI remodeler. A three-pronged consumer outreach campaign was devised after much research with NARI members and homeowners, and it encompasses print ad buys, search engine optimization (SEO) tactics and video. In the first part of the campaign, NARI will be making some national print ad buys in publications that have an audience of remodel-ready homeowners. In addition, NARI will customize these ads for the chapters to use. The second part of the marketing campaign encompasses SEO, which targets the way a homeowner might search via Google or Yahoo. To that end, the URL to which homeowners will be directed from the print ad campaign is www.nariremodelers.com. Homeowners will be able to search for NARI members by ZIP code, as well as by specialty. To kick off the campaign, NARI?chose categories based on Google Ad Words, which takes into consideration the words that are chosen when someone does a search on Google and the frequency of those words. This site can be found at www.nariremodelers.com. These landing pages, as they are called, also has a series of videos on them, explaining what NARI is, what the Code of Ethics means to a homeowner who chooses a NARI contractor, what certification means and a testimonial from a homeowner who has used a NARI contractor. There will also be a separate landing page of the videos, which NARI members can link to from their Web site, without having to worry that a potential client could click away and then find another NARI member. The link for this Web site iswww.nariremodelers.com/video-player-external.aspx. NARI members can download the HTML to use a NARI?logo with the video link embedded in it. These Web logos are available in 250×250 pixels, 180×150 pixels, 125×125 pixels and 65×65 pixels. These videos are also available to members and chapters that might want to use them at a home show display. A DVD is available upon request by e-mailing marketing@nari.org. Networking events on the local and national level, including two national Board Meetings and the “Evening of Excellence”.